The other day, I blogged about a to-die-for Bahamas beach house decorated by Miles Redd… If you haven’t seen the August issue of Architectural Digest with the feature, run – don’t walk! to your mailbox or local bookstore and pick up a copy. But let’s switch gears for a moment, because 1190 Chestnut Ridge Road is on the market… Design enthusiasts will immediately recognize this as a home decorated by Miles Redd and featured in the November 2010 issue of Elle Decor. 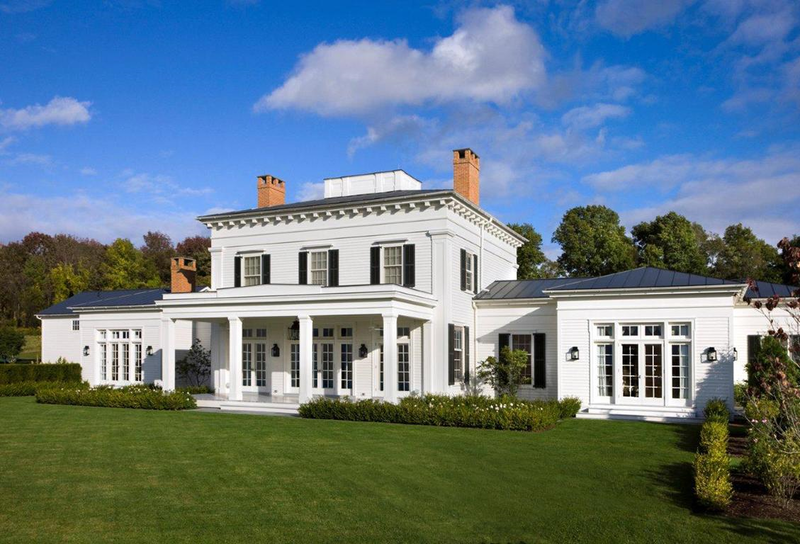 The 5,867 square-foot country house sits on 21.43 acres in the horse county of Millbrook, New York. 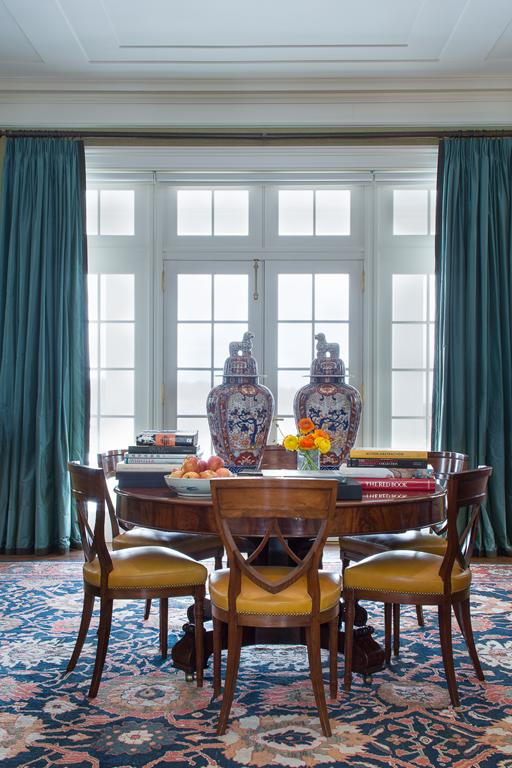 It was built in 2006 by Gil Schafer, an award-winning classical architect known for his exacting renovations, for a couple who decided to trade in their Upper East Side townhouse for a place in the country. 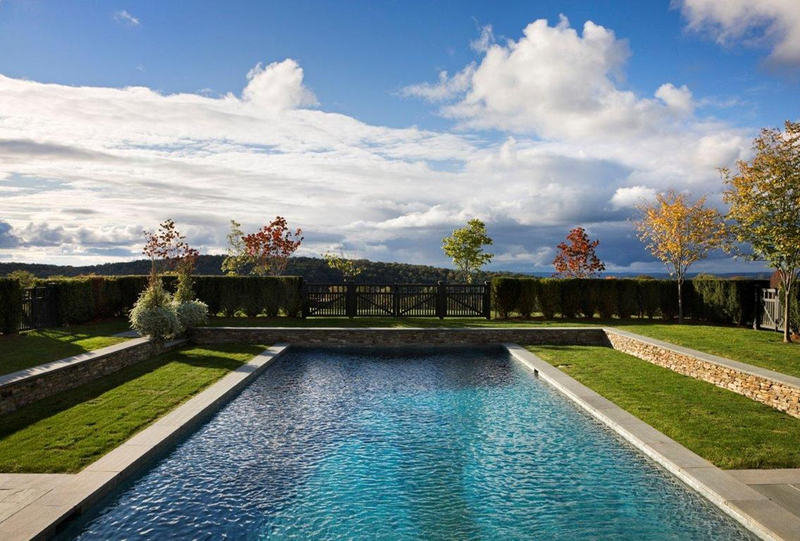 And now, for a cool $9.99M, this masterpiece can be yours! Oh, I do hope it comes furnished!! 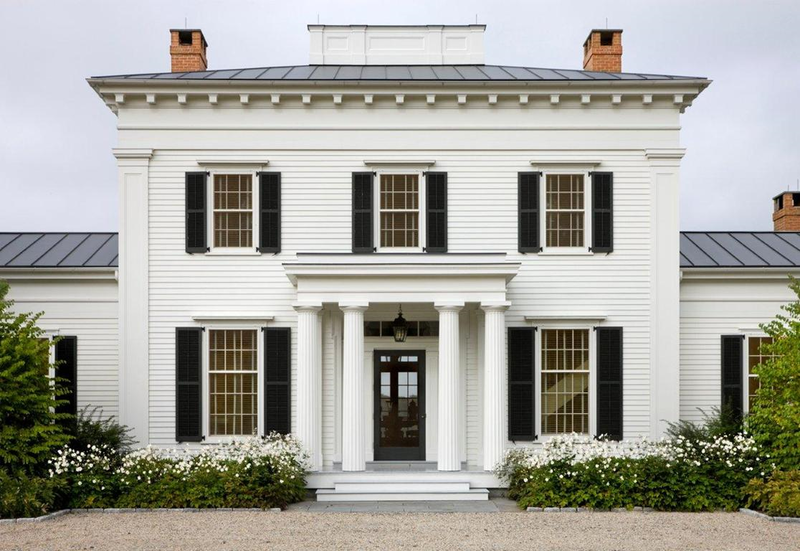 The front façade of the Hudson Valley home, in classic Greek Revival style. The entrance hall’s walls were hand-painted by Chris Pearson; the Art Deco table lamps are Greek, and the stair runner is by Stark. 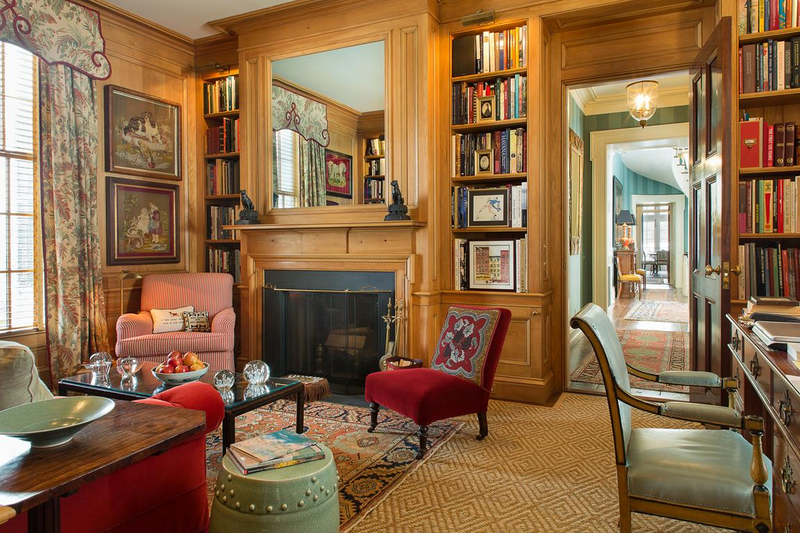 The sofas are upholstered in a Clarence House fabric, and the mahogany console bookcases are custom made. 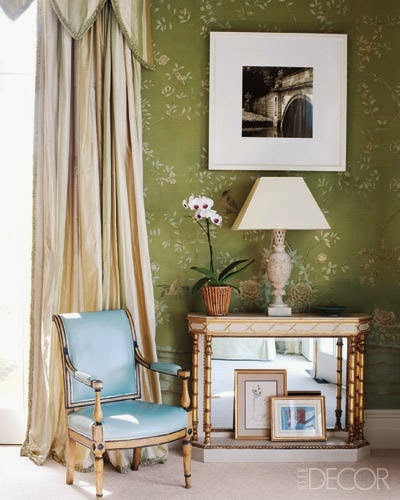 The tufted chair was purchased at auction; a painting by Tim Kent is displayed above a mantel designed by Schafer. 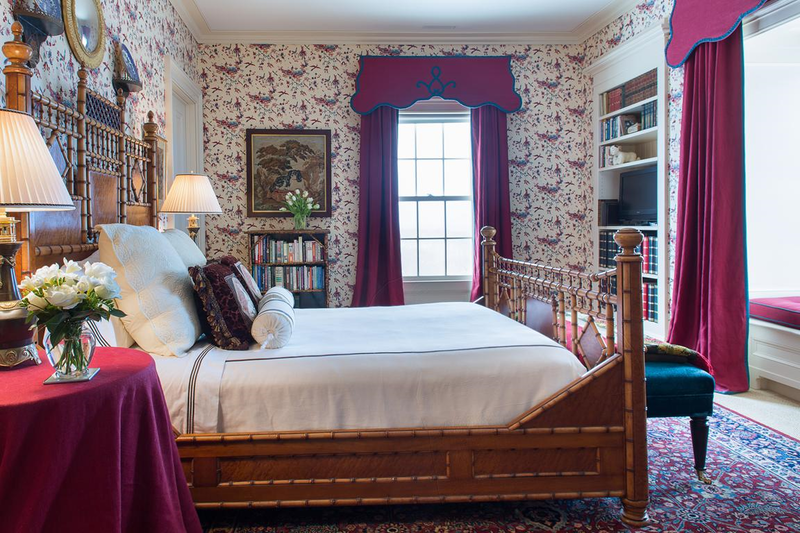 Here is a different view of the room above, from the MLS listing… Note the slight changes, including different lamps. 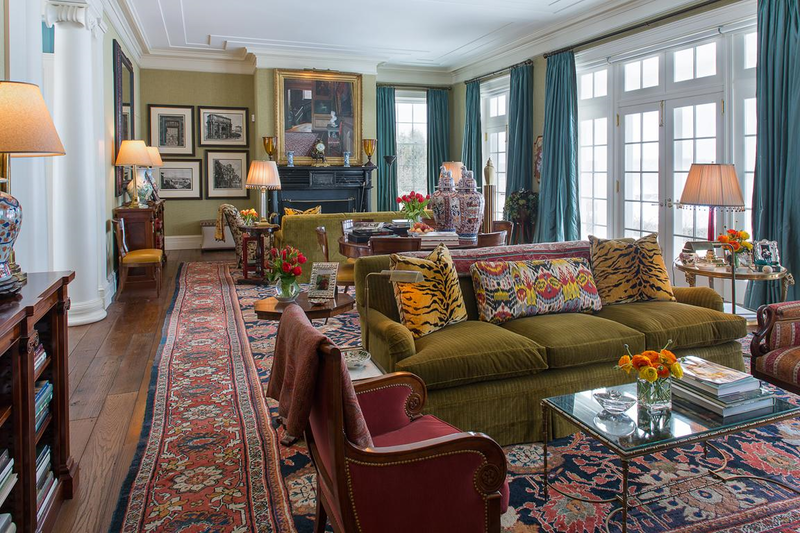 The colors of the circa-1880 Persian Sultanabad in the living room are repeated in the Cowtan & Tout cotton used on the bergère, in the curtains of Jim Thompson silk, and in the Kravet silk that sheathes the walls. 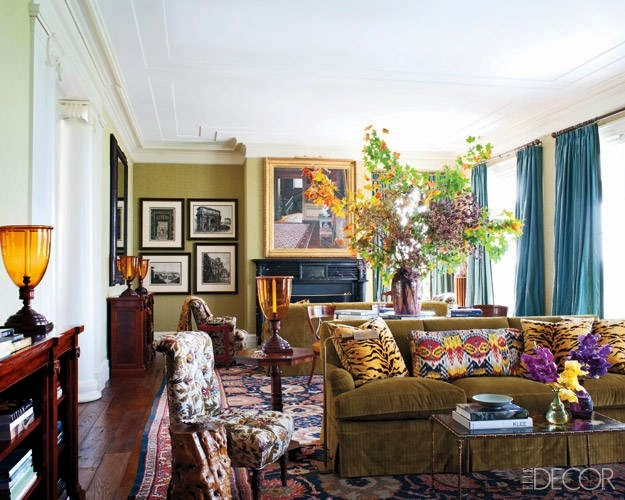 Again, here is a different view of the room above… Can you spy the subtle changes made since the Elle Decor photo shoot? The library is paneled in pine. 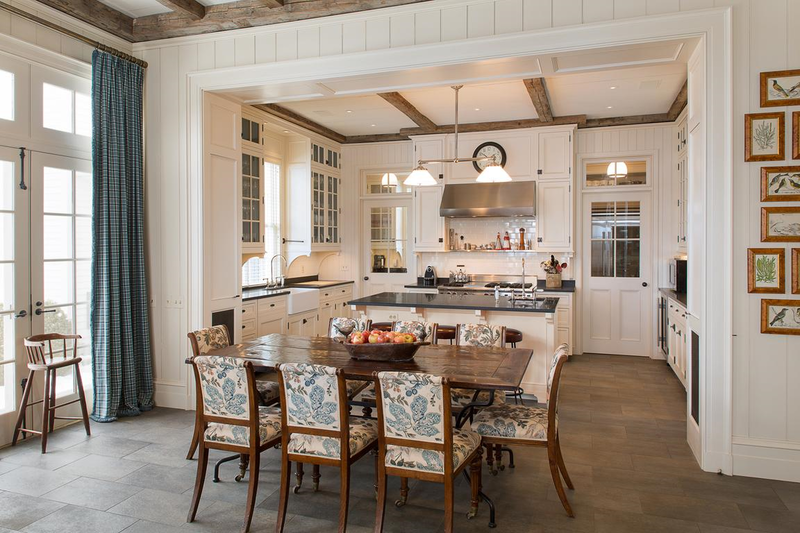 The kitchen cabinets are custom made, and the vent hood is by Wolf; the 19th-century chairs are upholstered in a Bennison fabric. The butler’s pantry is painted Hague Blue by Farrow & Ball. 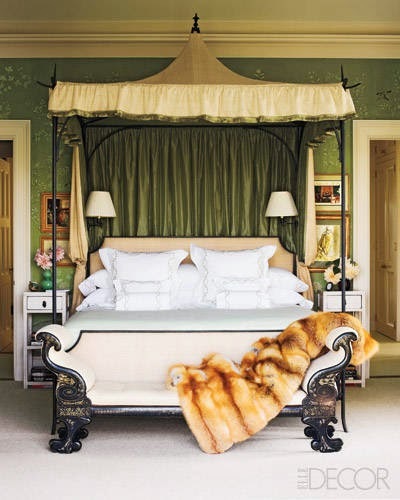 In the master bedroom, the wrought-iron bed by Oscar de la Renta is fitted with a canopy of silk by Roger Arlington Designs; the bedding is by E. Braun & Co., and the bench is 19th century. 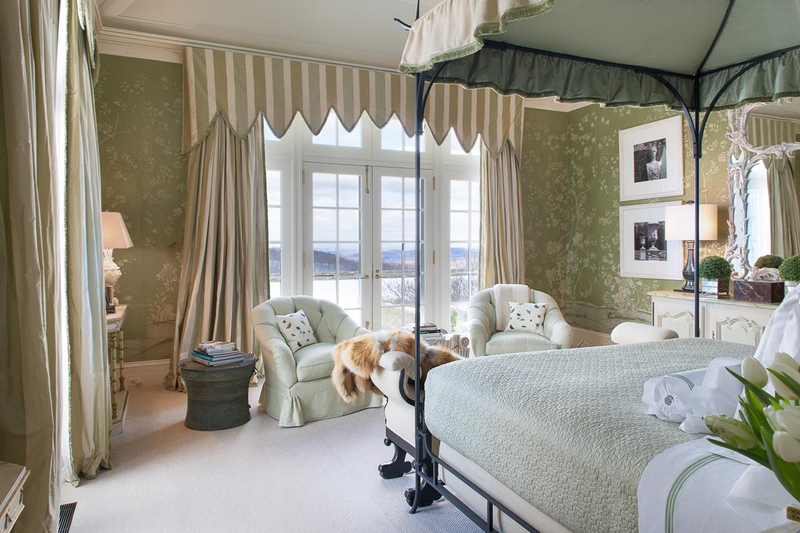 The master bedroom’s Directoire armchair is upholstered in Edelman leather, and the console and lamp were found at auction; the curtains are of a Clarence House silk, and the wall covering is by de Gournay. 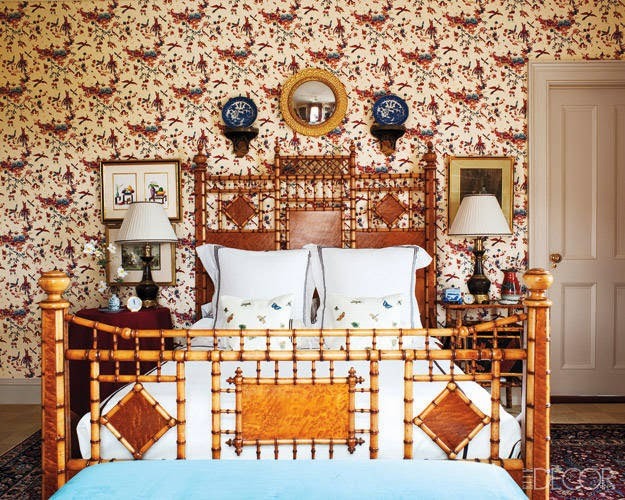 The walls of a guest room are covered in a Georges Le Manach cotton, and the 19th-century bamboo bed is dressed with Matouk linens. 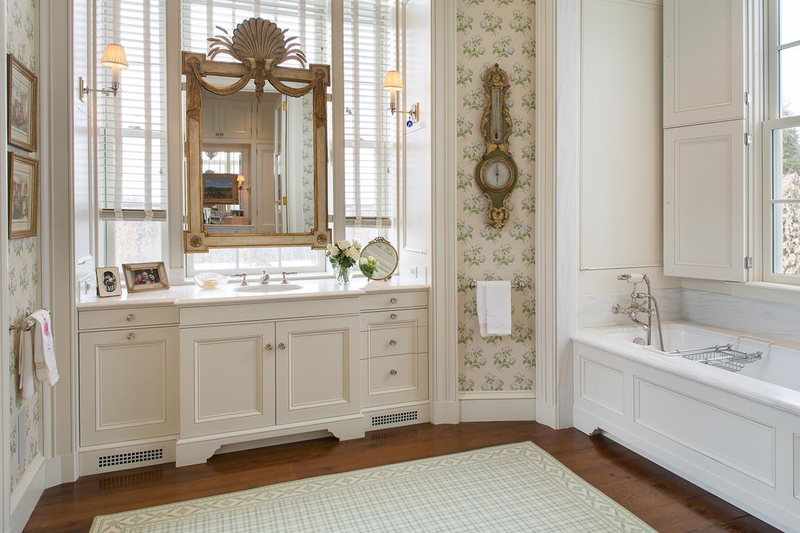 The powder room sink by St. Thomas Creations has Barber Wilsons fittings; the walls are covered in cork, the mirror is custom made, and the sconce is from Ann-Morris Antiques. Landscape developed by Warren Byrd. 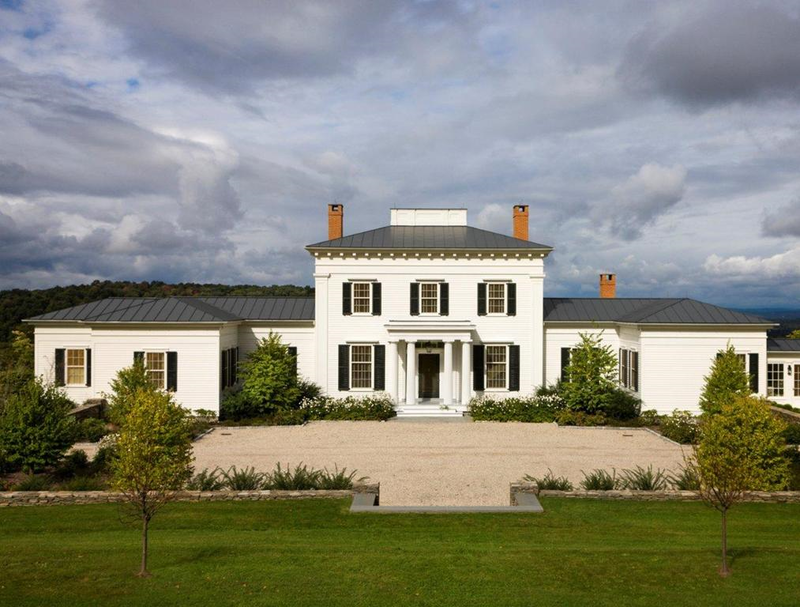 The home offers spectacular views of the Hudson Valley and Catskill Mountains. 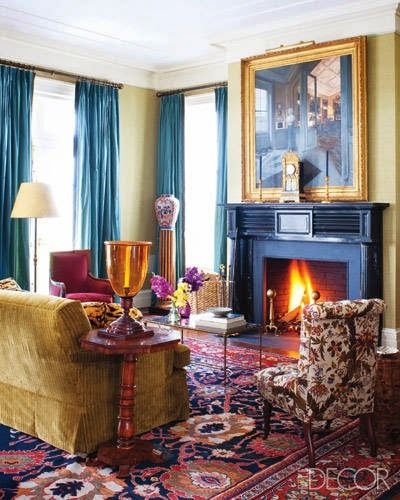 Images via Houlihan & Lawrence and Elle Decor. 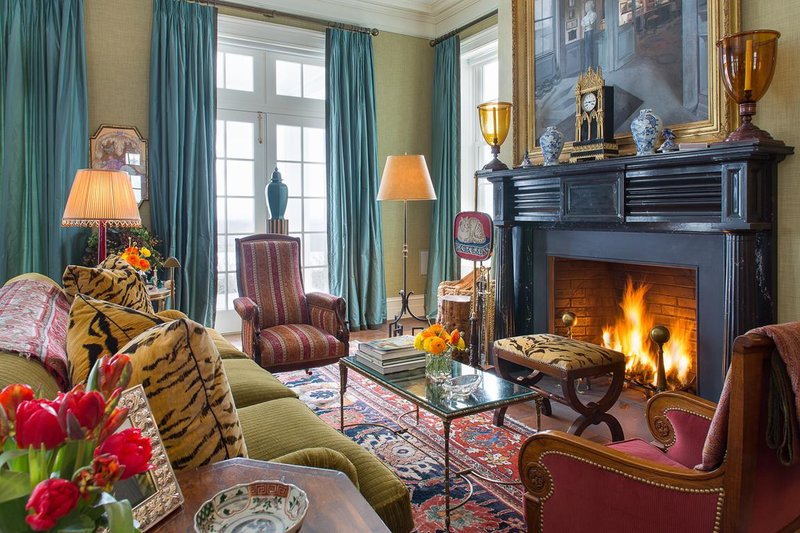 There is something about this exquisite home that makes me long for fall… Wouldn’t you just love to curl up on that Clarence House sofa with the tiger velvet pillows and roaring fire, while sipping a cup of hot apple cider? For more information, please contact the brokers, Houlihan & Lawrence. Great post – I always love seeing a house in real life versus magazine styling. There are fewer differences than I would have expected. I have an acquaintance who lives in a Miles Redd decorated house that has been published, and her house was not specially styled for the magazine shoot – it's all as it looks every day. Fabulous! 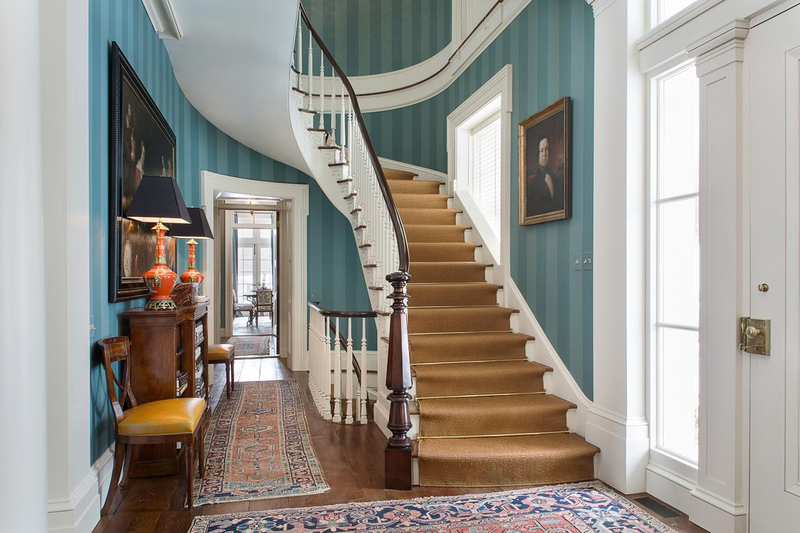 I love the entry hall…the hand painted striped walls make an awesome statement and the staircase is beautiful. I also love the console in the master bedroom. Butler's pantry is impressive…it appears to be the size of my kitchen…loving the kitchen in this home and how it opens to a sitting room. Love this house. 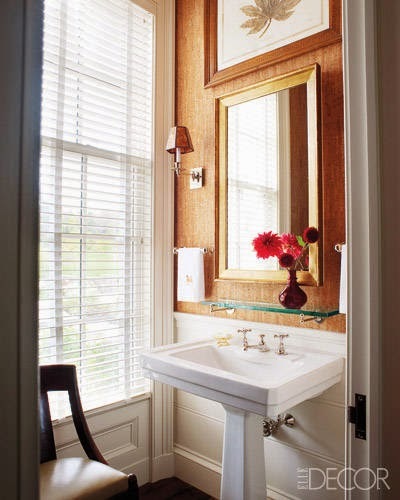 Master bath mirror – love it! I could become a real homebody if I lived here! Oh, I remember it well ! Adore the exterior as well, which I don't recall from the magazine! I wish I could buy it!!! The kitchen is my favorite part. 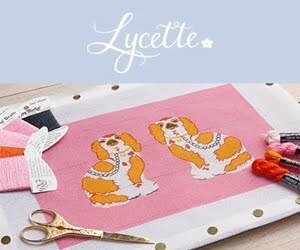 Wonder if it will sell fast?